Does everyone know "FOLLOW ME"? One of my favorite shampoo brand since when I was a kid. Follow Me is Tohtonku’s most beloved brands and recently is celebrating its 30th anniversary. The celebration was themed as “30 Years of Quality” and signified Follow Me’s commitment towards Malaysians of the past and the future. Congratulations FOLLOW ME!!! 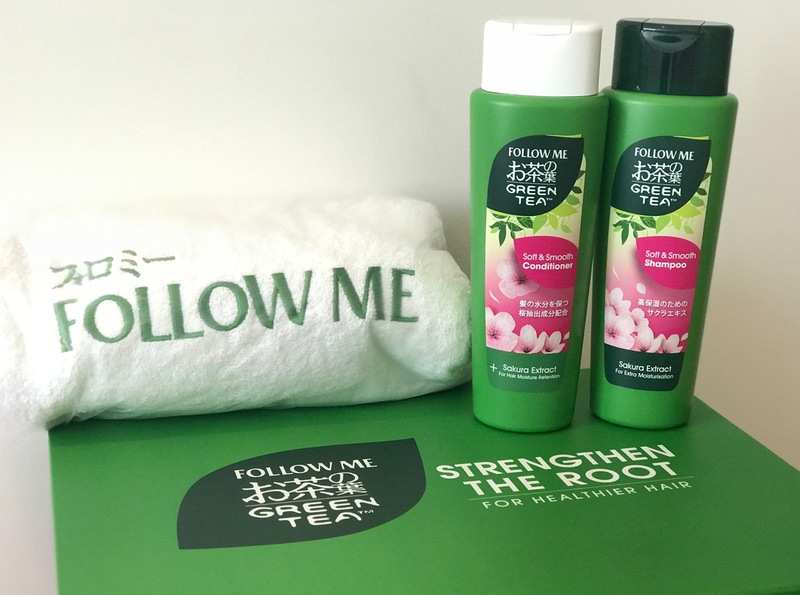 Follow Me has just launched its reformulated Green Tea Shampoo in a brand new premium packaging. Formulated with green tea and natural plant extracts, this new formulation helps strengthen hair from the roots and leave hair feeling healthier and more manageable! Follow Me Green Tea Soft & Smooth Shampoo + Follow Me Green Tea Soft & Smooth Conditioner - Formulated with Green Tea and Sakura extract, the Follow Me Soft & Smooth Shampoo helps moisturise and hydrate your scalp, keeping your hair silky smooth, shiny and revitalized. To obtain maximum moisturizing effect, use it together with the Soft & Smooth conditioner as it helps lock in moisture and vital nutrients for the hair. It is suitable especially for those who have frizzy, dry hair with split ends. The Green Tea Shampoo is rich in Vitamin C and E to provide protection for the hair follicles while at the same time ensuring that your hair is always smooth and silky. While Polyphenol (a type of natural compound found in the Green Tea extract) helps keep the scalp healthy, the combination of various plant extracts alongside antioxidants found abundantly in the Green Tea extracts protect the hair from free radicals to further strengthen hair roots, promote hair growth and prevent hair thinning. As a Malaysian, I am proud that Follow Me to be the largest homegrown brand and to have been the witness to the country’s growth. Follow Me's product will surely fulfil each of your daily personal care needs. Both the newly upgraded Green Tea Shampoo (320ml/650ml) and hair conditioner (320ml/650ml) retail at RM 10.90 and RM 18.90 respectively. They are available at all leading hypermarkets, supermarkets and selective pharmacy stores.